Bus, boat, bus, plane, bus – that is how we traveled from Galapagos back to Quito, Ecuador for the last day of this amazing adventure. 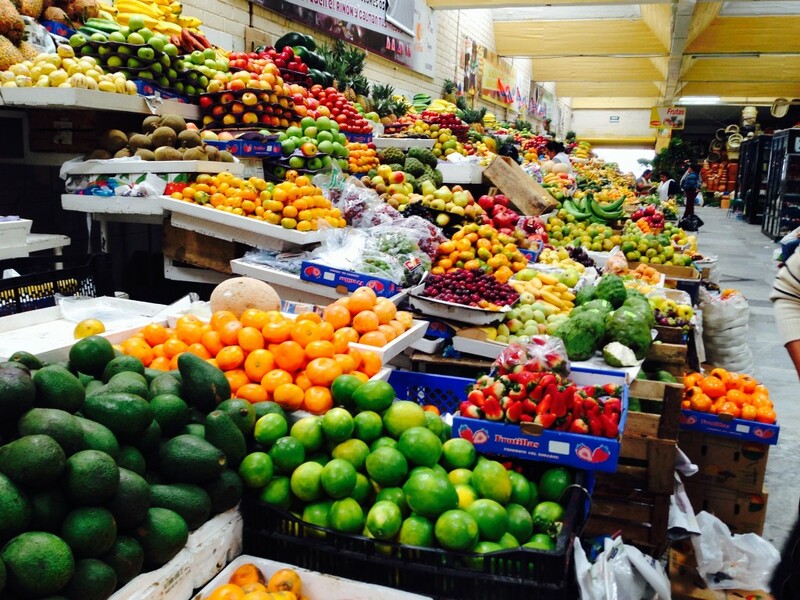 First stop was the Inaquito produce market in Quito. Filled with the bounty of the region, two worship sites-one for Baby Jesus and one for the Virgin Mary and men playing a traditional Ecuadorian card game. It was a colorful and fragrant way to begin our final day. While trying to find some hot sauce to bring Paul, I was inspired to get creative with the little Spanish I knew. Remembering that the name of the town of Aguas Calientes meant hot water, I pantomimed shaking a bottle and said calientes. The women at the market stall all started laughing, and I thought my pronunciation must be pretty bad. Later that evening our guide told me that calientes had two meanings, and I had said something like “I was hot.” No wonder they were laughing. I did later find the hot sauce. We made a quick stop for ice cream. 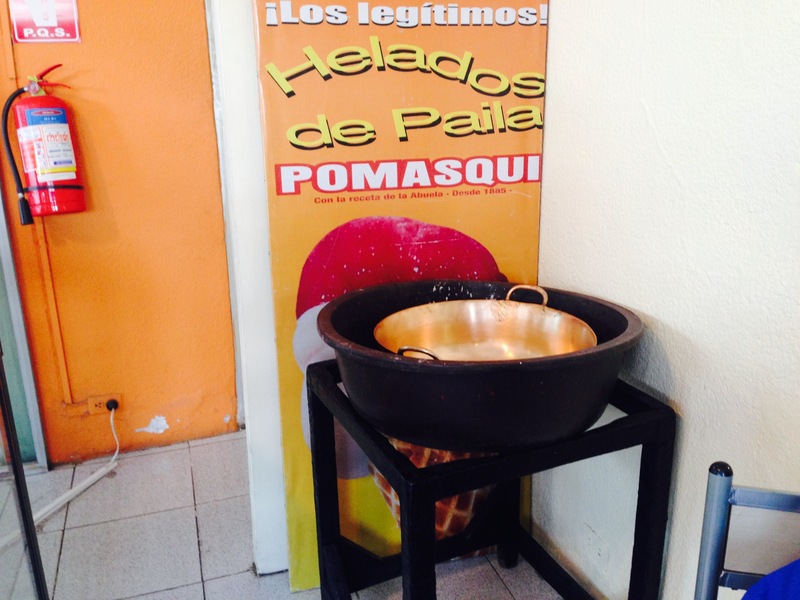 The shop makes each ice cream flavor by hand daily in a copper pot set in a larger pot of salt. In addition to chocolate, vanilla and coconut, they had flavors made from the tropical fruit of the area. I had coconut and taxo, which is like passion fruit. 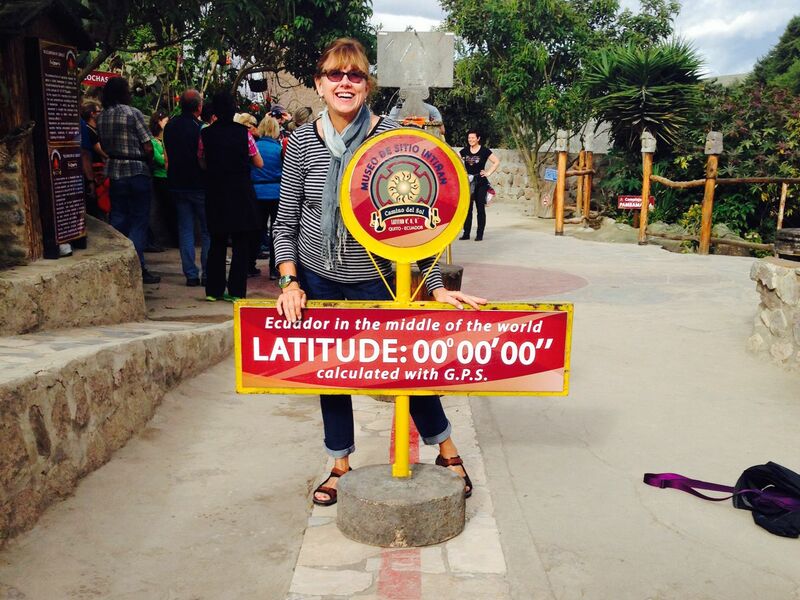 The equator runs through Ecuador, and our next stop was the Inti Nan Museum right on the equator. Inti Nan is the Quechua phrase for “Path of the Sun”, and we saw replicas of indigenous sun temples, displays of reptiles and fish of the area, and artifacts of previous eras. As we entered the museum a man in native dress was performing one of the traditional dances. I even got to dance with him. A line and marker in the museum indicate the exact spot for the equator, and we were able to have our picture taken with a foot in each hemisphere. Our last stop was the Mindalae Museum for a tour and farewell dinner. Our final Ecuadorian treat was a glass of canelazo, a hot spiced cinnamon rum drink before dinner. 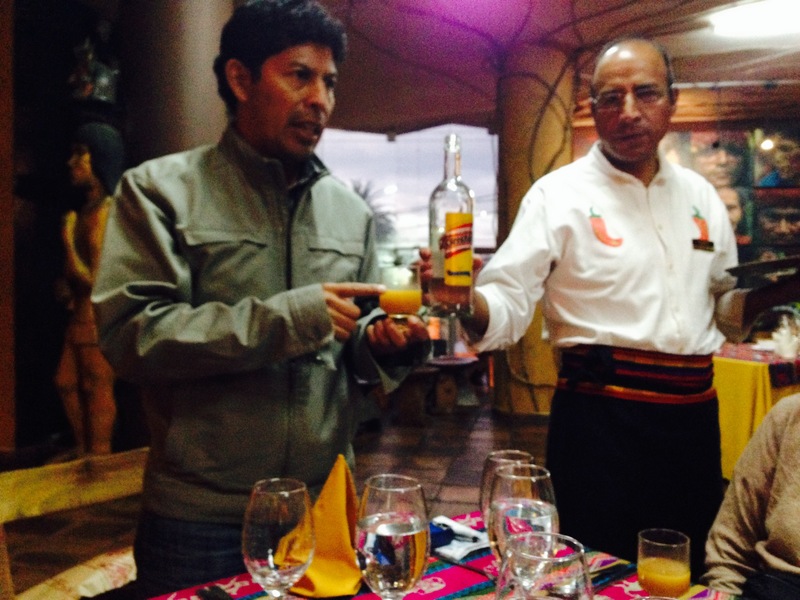 Our guide told us that the Ecuadorians drink canelazo at special family gatherings. It was delicious. With mixed feelings I boarded the plane to come home. I missed my husband and was looking forward to seeing family and friends, but I was sad to leave the two beautiful countries of Ecuador and Peru. Each was unique, but they both shared astounding natural beauty, cultural joy, strong historical roots, spirituality, friendly and gracious people and the amazing ability to share their country with visitors. I look forward to a return trip someday. This entry was posted in Peru 2014 on May 5, 2014 by debbie.